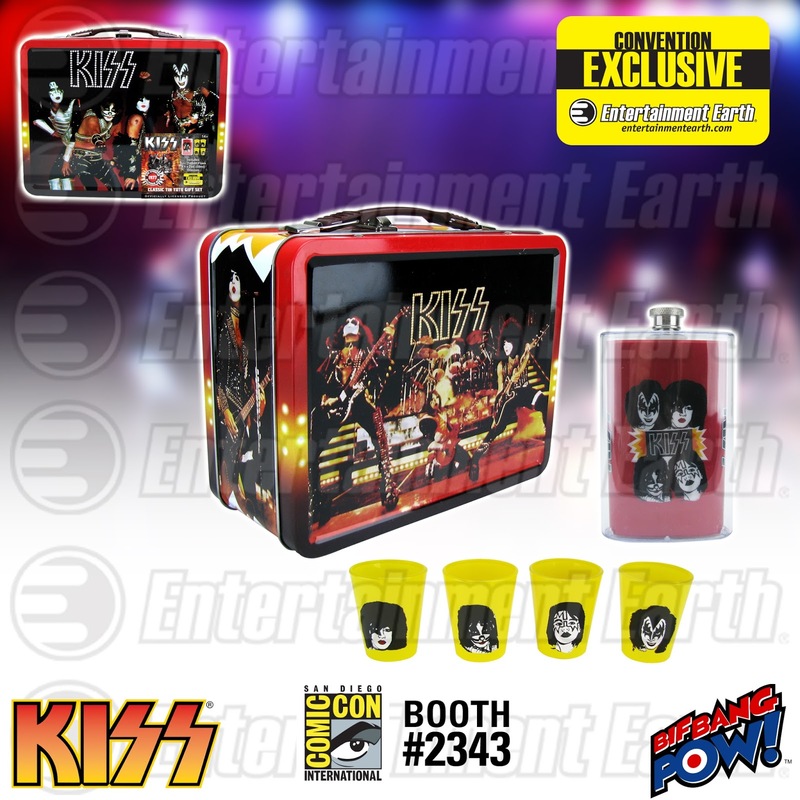 KISS, Epic Rights, Bif Bang Pow!, and Entertainment Earth proudly present a rare autograph signing session with KISS at the Entertainment Earth booth #2343 during San Diego Comic-Con 2015. 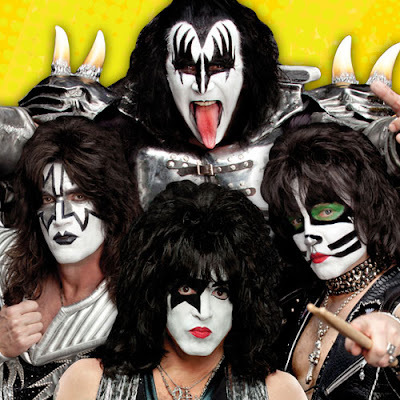 KISS members Gene Simmons, Paul Stanley, Tommy Thayer and Eric Singer are scheduled to sign autographs at the Entertainment Earth booth on Thursday, July 9, 2015 from 5:30pm to 6:30pm. All signings at the booth are free, but require a ticket. Details on how to obtain a randomly distributed ticket will be available at the Entertainment Earth booth on the first day of the show. And speaking of KISS, Entertainment Earth is excited to announce their latest KISS convention exclusive. This brand new KISS Classic Tin Tote Gift Set - Convention Exclusive made by Bif Bang Pow! is an incredible recreation of the original lunchbox from 1977. The classic KISS tin tote features vintage images of KISS in concert. The inside has been updated for adult collectors, as this set includes a flask and four shot glasses with artwork from the original drink container. And, making it a true collectible, the run will be limited to just 2,960 pieces, each individually numbered. Available starting July 8, 2015 at the Entertainment Earth booth #2343 at San Diego Comic-Con, fans will have the first opportunity to grab the KISS Classic Tin Tote Gift Set - Convention Exclusive as well as the KISS Alive II Stage with 1:20 Scale Action Figures - Deluxe Box Set #1 - Convention Exclusive and KISS Album Cover Coaster Set in Miniature Guitar Case - Convention Exclusive. All of the KISS convention exclusives are limited editions and individually numbered! Not attending San Diego Comic-Con 2015? *PRE-ORDER your KISS Classic Tin Tote Gift Set - Convention Exclusive, KISS Alive II Stage with 1:20 Scale Action Figures - Deluxe Box Set #1 - Convention Exclusive, and KISS Album Cover Coaster Set in Miniature Guitar Case - Convention Exclusive at Entertainment Earth now! See more of our KISS collectibles here!